Engineers shouldn’t have to be reminded of the dangers associated with pressure vessels; we just need to look at the ideal gas law. Moreover, events like the 1905 Massachusetts boiler explosion have shown us that without the proper safety measures engineering pressure vessels can go bad quickly and with deadly consequences. This has led ASME to create codes that pressure vessels and boilers must meet to ensure safety. Adrian Jensen, Sr. Staff Mechanical Engineer at Predictive Engineering, tends to work with ASME Section VIII, Division 2 pressure vessels. He notes that these tanks are becoming more popular in the engineering analysis world as they are well suited to be idealized and optimized using simulation. Table 1: ASME Section VIII Pressure Vessel Classification. He continues “Maybe you don’t have a complicated vessel, maybe you don’t need optimization. You are still going to need an advanced analysis program. You are going to need to use FEA to certify this vessel for seismic analysis.” So it seems that regardless of your design, simulation can play an important role in getting your ASME certification. 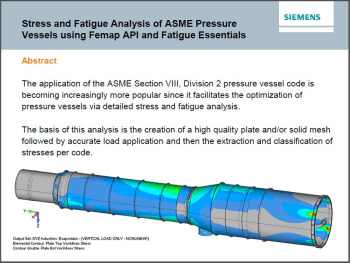 Jensen used Femap and API (Application programming interface) to create an optimized pressure vessel. To do so you will need a high quality mesh, accurate loads and efficient pre- and post- processing tools. “We put a lot of work into the building of the geometry and the creation of the mesh. That allows these special stress evaluations to be easier down the road,” says Jensen. Figure 1 depicts the cross section through a nozzle or other shell penetration. It is modeled with plate elements; however, the true structure will have additional thickness at the weld. “Per ASME guidelines, the first stress evaluation point we look at is at the toe of the weld,” explains Jensen. He cautions that “we don’t recover stresses at the mid-plane intersection. That singularity is going to give you artificially high stresses.” Femap makes it so you can move away from these discontinuities. Users can place the nodes where they are needed to study stresses accurately. “By default we get top and bottom stresses for plate elements. But (for ASME) we also have to look at stress at the mid-plane, the membrane of the elements. Fortunately, these output vectors are easy to calculate using an API. I commonly use the stress intensity calculator under Femap’s custom tools,” says Jensen. When learning to program in Femap’s API Jensen suggests it is best to search the directory and look at the code of similar programs. You can learn how the programs work and see what parts are useful to your code. You can then mix and match them together as needed or come up with your own. Figure 2: Pressure vessel fills with liquid oxygen. One complicated simulation to produce is a transient thermal analysis of a pressure vessel, i.e. filling the tank. Assuming the tank starts at room temperature, and it is filling with liquid oxygen at the bottom, there will be two simultaneous transient thermal conditions. The first transient thermal condition is that the temperature profiles will change with time. There will be a temperature gradient through the thickness. The next transient thermal condition is that the fluid level will be changing, which is complicated by the fact that the fluid boils on contact with the tank wall. This “makes an extremely high heat transfer coefficient where the delta T isn’t quite as great. But as we drop below that boiling, we get the non-boiling region we have a lower heat transfer coefficient with a slightly higher delta T,” says Jensen. 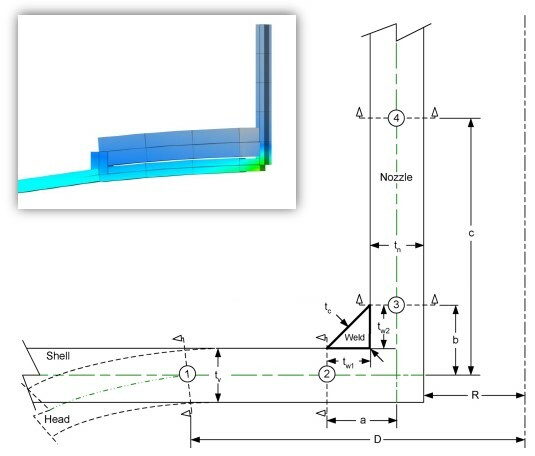 To perform this analysis traditionally, Laird explains, you would map a temperature profile on the load and perform the thermal stress using NASTRAN. Unfortunately, this is only one time step. You will have to repeat the process for each time step. That’s why Laird and Jensen came up with a different solution. “We broke this down into 90 steps over the 15 minutes (fill time) so the API maps the loads on the inside of the vessel and the transient thermal analysis generates 90 result cases with full temperature profiles. Then, as you have only one constraint set in NASTRAN, you don’t have to run it 90 times. Just run the stiffness matrix once, slap the loads on it, and you’re done in 5 minutes,” boasts Laird. Figure 3: Fatigue Essentials analysis of a pressure vessel. Once the vessel passes its initial load criteria it must be assessed under fatigue with respect to cyclic thermal and mechanical loads. “This work is algebraic in nature, there’s a lot of number crunching so the API, spreadsheets, and programming can really save some time … As we move on we realized we hit a point where we were working with too much data and it was too complicated. So we’ve developed Fatigue Essentials to help us out organizing the data and automating the process,” adds Jensen. Fatigue Essentials provides an intuitive interface to manage complex analysis such as the aforementioned ASME Div. 2 example. For these problems, traditional hand calculations become too cumbersome to manage. Despite the fact that Laird has just released Fatigue Essentials on the market, he suggests you “Avoid software sales people. Do your own work, software isn’t going to solve your problems. How to solve a problems means understanding the physics behind it. And be able to do first order approximations via hand calculations, sketches, or intuition. If you have to rely on software out of the gate to solve your problems then it probably means the problem is over your head and you don’t know what you are doing … If you don’t have the right training you just get the wrong answer faster.” Sounds like sage advice from one engineer to another. 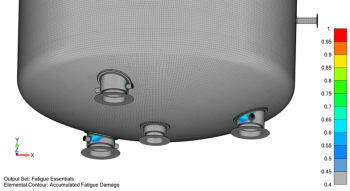 For more on Fatigue Essentials follow Predictive Engineering.